We all learnt from the Nationals this year that we had to leave real early to avoid traffic and not miss our chance to race in the showdown for “gold”. All arriving in ample time and a little warm up which involved chasing cows off the course, and narrowly missing dogs racing around off leads. Sophie still having Woodstock as second claim and good friends meant that their Belgrave coloured tent suited us well to base for the day.On the first leg was Sophie, experienced from the Nationals on the initial charge which up the hill Lou and Sam witnessed a charge for a small lead over Claire Martin who later turned out to be in super shape with a 42 second overall lead on Sophie. We know Sophie had worked hard seeing her pushing up the hill for the changeover. Next up was our long serving Belgravian and London marathon veteran Lou. Photos showed she pushed as hard as possible to stay in 2nd but the other girls on her leg were quicker and she was chased down. With Lou climbing the hill for the change over to me, I saw Lou in 4th and very closely behind was 5th, I did somewhat feel dispondent – was the gap to large to make up? I took a look at the girl waiting for her change over next to me and knew I had to go out hell for leather to make her give up… not sure after the 100 miler where the legs came from: it hurt, the lungs burning I climbed to chase the others, in my own mind somewhat had given up but when I realised I was closing down the Salford lady on the top section and just after the turn my eyes lit up they were coming back to me… Salford were over-taken on the downhill section, then the Coventry girl was next, constantly tracking her and getting closer she was breathing heavy. Legs were hurting but all the time, told myself its not a fraction on a 100 miles and you have the short leg today. By the lake about 900m before the end I steamed past up the last bend and pushed all the way to give Zoe the best chance I could, handing over in second. This gave her the race she wanted (later told me “it was the kick up the arse I need :-)” ) as sometimes not being in the initial charge means it always feels like a time-trial. Zoe kept Telford in her sights and Salford overtook at the top of the first hill and at the cone turning point only a few seconds ahead. Lou, Sophie and I screamed when we saw Zoe at the downhill point still closely tracking Salford/Telford and also now being chased from behind. We could see the pain in the face pushing the last 1k or so to keep Belles in a medal position. Zoe didnt want to start sprinting too early because there were two climbs before the final straight, with a cheeky look behind she kicked all the way up the hill to the finish. We medalled and Zoe’s relief of laying on the ground said it all! We all analysed the race after, hindsight is a great thing, We could have wished for an extra few seconds off our times but with marathons, ultra distances and injury comebacks it was one of the most exciting races we have run in good competition. 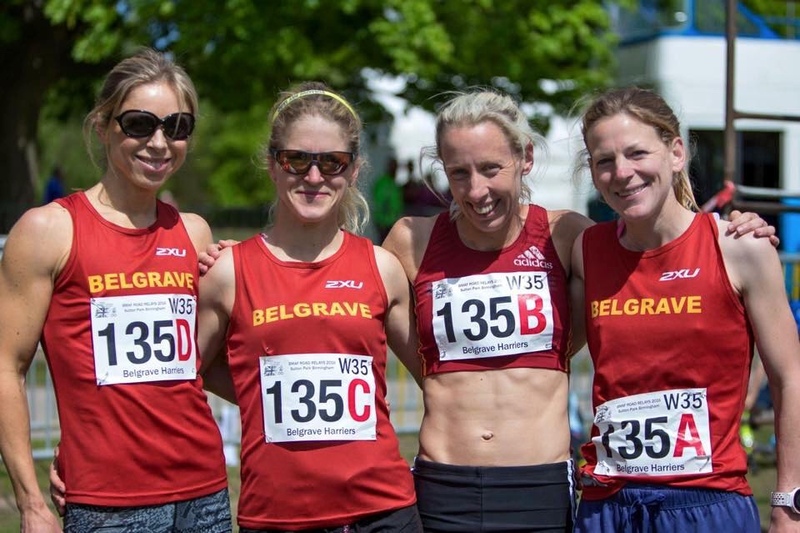 1 Salford 1:14:00; 2 Telford 1:14:02; 3 Belgrave 1:14:07, 4 Heanor 1:14:14. 31 teams started, 26 finished. S Carter (2) 17:47; L Blizzard (4) 19:33; S Amend (2) 17:34; Z Doyle (3) 19:13. Fastest: C Martin (Telford ) 17:05; L Palmer (Heanor) 17:23; P Richardson (Coventry) 17:28; S Amend (Belg) 17:34.